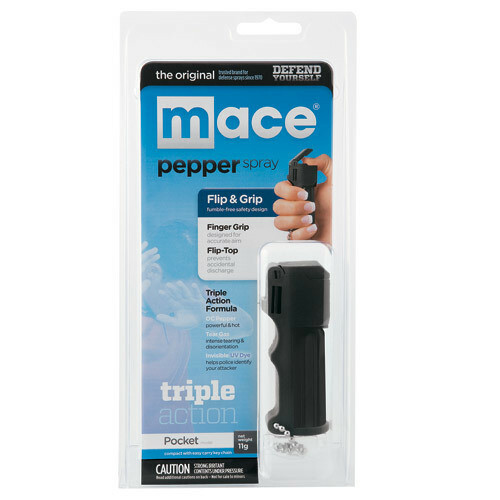 MACE TRIPLE-ACTION combines OC PEPPER with CN TEAR GAS along with a UV MARKING DYE. OC PEPPER causes eyes to slam shut and uncontrollable coughing and choking. CN TEAR GAS causes profuse tearing, an intense burning sensation to the face and disorientation. Compact size fits comfortably in any hand. Finger-grip dispenser correctly orients the unit even in the dark. Features flip-top safety cap and keychain. 11 gram unit sprays 6-12 feet.